WEST LAFAYETTE, Ind. — After starting a successful West Coast run, Brooklyn glam-rock band Semi Precious Weapons will replace Kid Cudi for the remaining Lady Gaga Monster Ball Tour dates through 2010, which includes the sold-out show on Jan. 14 at Purdue University in West Lafayette, Indiana. The band has recently received rave reviews on their tours with Ladyhawke and The Sounds. 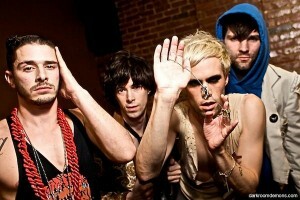 Semi Precious Weapons took a break from its busy touring agenda to get back into the studio with producer Jack Joseph Puig (The Rolling Stones, Green Day) in November. The band’s upcoming new record is due out next year.